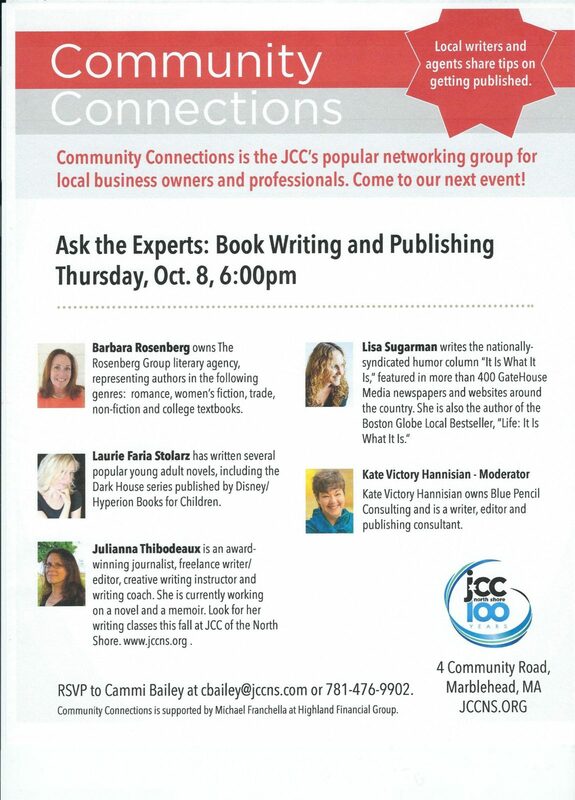 If you’re writing a book (or want to write one) and have questions about the writing process and the business of publishing, come to the next “Community Connections” networking event at the JCC of the North Shore in Marblehead, MA. I’ll be moderating a panel discussion, “Ask the Experts: Book Writing and Publishing,” on Thursday, October 8, at 6 PM. The event takes place at the JCC North Shore, 4 Community Road, Marblehead, MA. More information at www.jccns.org. Barbara Rosenberg owns The Rosenberg Group literary agency, representing authors of romance, women’s fiction, trade, non-fiction, and college textbooks. Laurie Faria Stolarz has written several popular young adult novels, including the Dark House series published by Disney/Hyperion Books for Children. Julianna Thibodeaux is an award-winning journalist, freelance writer/editor, creative writing instructor and writing coach. She is at work on a novel and a memoir, and teaching writing classes this fall at JCC of the North Shore. This event is free and open to all who RSVP in advance. The Community Connections program is supported by Michael Franchella at Highland Financial Group. Please RSVP to Cammi Bailey at cbailey@jccns.com or 781-476-9902. Hope to see you there! please sign me up for October 8 th. Tom, this event happened last fall — I’m just seeing your comment now!